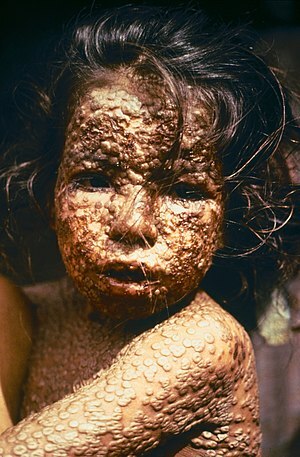 The origin of smallpox is unknown. 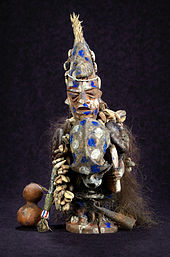 The earliest evidence of the disease dates back to the 3rd century BCE in Egyptian mummies. The disease historically occurred in outbreaks. 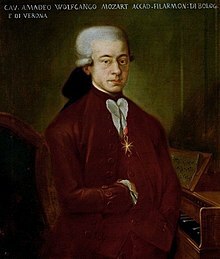 In 18th-century Europe, it is estimated 400,000 people per year died from the disease, and one-third of the cases resulted in blindness. 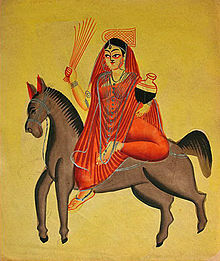 These deaths included those of four reigning monarchs and a queen consort. 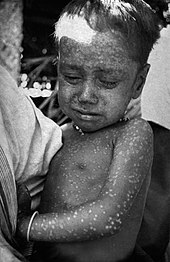 Smallpox is estimated to have killed up to 300 million people in the 20th century and around 500 million people in the last 100 years of its existence. As recently as 1967, 15 million cases occurred a year. 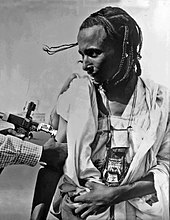 Vaccination during the Smallpox Eradication and Measles Control Program in Niger, February 1969. 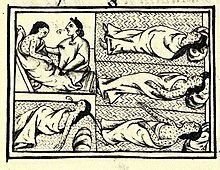 According to a theory put forward in Journal of Australian Studies (JAS) by an independent researcher Christopher Warren, British marines used smallpox in 1789 against indigenous tribes in New South Wales. This theory was also considered earlier in Bulletin of the History of Medicine and by David Day in his book Claiming a Continent: A New History of Australia. 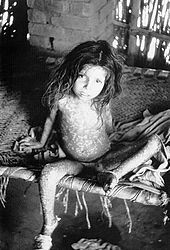 However it is disputed by some medical academics, including Professor Jack Carmody, who in 2010 claimed that the rapid spread of the outbreak in question was more likely indicative of chickenpox--a disease which, at the time, was often confused, even by surgeons, with smallpox, and was in fact comparably deadly to Aborigines and to other peoples without natural immunity to it. Carmody noted that in the 8-month voyage of the First Fleet and the following 14 months there were no reports of smallpox amongst the colonists and that, since smallpox has an incubation period of 10–12 days, it is unlikely it was present in the first fleet; however, Warren argued in the JAS article that the likely source was bottles of smallpox virus possessed by First Fleet surgeons. Ian and Jennifer Glynn, in The life and death of smallpox, confirm that bottles of "variolous matter" were carried to Australia for use as a vaccine, but think it unlikely the virus could have survived till 1789. 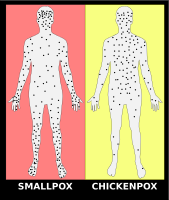 In 2007, Christopher Warren offered evidence that the British smallpox may have been still viable. However, the only non Aborigine reported to have died in this outbreak was a seaman called Joseph Jeffries, who was recorded as being of "American Indian" origin. 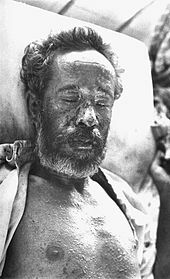 W S Carus, an expert in biological weapons, has written that there is circumstantial evidence that smallpox was deliberately introduced to the Aboriginal population. 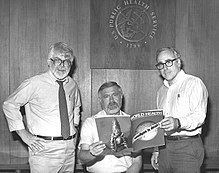 However Carmody and the Australian National University's Boyd Hunter continue to support the chickenpox hypothesis. Responding to international pressures, in 1991 the Soviet government allowed a joint U.S.-British inspection team to tour four of its main weapons facilities at Biopreparat. The inspectors were met with evasion and denials from the Soviet scientists, and were eventually ordered out of the facility. In 1992 Soviet defector Ken Alibek alleged that the Soviet bioweapons program at Zagorsk had produced a large stockpile – as much as twenty tons – of weaponized smallpox (possibly engineered to resist vaccines, Alibek further alleged), along with refrigerated warheads to deliver it. Alibek's stories about the former Soviet program's smallpox activities have never been independently verified. ^ Carus, WS (2015). "The History of Biological Weapons Use: What We Know and What We Don't". Health Security. 13 (4): 219–55. doi:10.1089/hs.2014.0092. PMID 26221997. ^ See fuller discussion of their views and those of Dr G E Ford in "The History Wars: Smallpox Debates".